For reasons that are not entirely clear to me, I missed the 2017 version of this list. That’s okay because what has happened since April of 2017 in the flashlight world has been downright fascinating. The market and the designs are moving in multiple directions at once and its very hard to predict where things are going to end up. I’ll try nonetheless. It was, in some ways, a banner year for torches and in others a period of being lost in the wilderness. The biggest news from the flashlight world is something that broke in January—47s was bought out by friend of the blog Jason Hui at Prometheus. 47s had been one of the most innovative companies in the space, pushing the envelop with new and interesting features for years (in particular, I appreciate their effort to incorporate moonlight low on every new light). Having Prometheus buy 47s was, before it happened, something I would have considered impossible, a bit like Ariel (maker of my dream car the Ariel Nomad and the awesome Ariel Atom) buy GM. But it happened. My hope is that this move will change the playing field for production lights and introduce new and better designs to the marketplace. Good Luck Jason! Beyond the business end of things, the Flashlight Union circa 2018 is as bad and as good as it has ever been. Production lights seem to have lost their way, but there is reason to believe we are just between cycles more than a near end of the boom times. Meanwhile, the custom end of the market is more vibrant than ever. In some ways flashlights are the inverse of knives—bland production market and fascinating custom market. Obviously that is a very subjective statement, as are all the statements made on this site, but I have had my fill of custom TFFs and have yet to quench my thirst for high end lights. What’s the problem with the production market? I believe it is simple—the lumens arms race, made possible by an agreement among makers to use standardized ANSI measurements, has taken the focus away from everything else. A good body tube and UI can make a 138 lumen light very useful for many years, whereas an awful UI on a 600 lumen beast can make me want to throw the former out the window. The ANSI agreement was supposed to cut down on cheaters, folks that claimed insanely high output numbers, but all it has done is standardize the various forms of spec cheating and given consumers a misleading “one number equals quality” message (in this case, the number is lumens). As the saying goes—judge a light by lumens is like judging a bourbon by proof (if you happen to know who said that, drop it in the comments, I searched for hours looking for the source of that quote). The result of this stupidity is a host of great flashlights with fundamental flaws. The clip on the S1 is one of the worst features on a sterling piece of kit I have ever seen. The Surefire Titan Plus has a few flaws. The Zebralight SC52 has a major flaw. Over and over again, we see production lights with lots of promise finished off by lazy design work in the details. I am not sure this is a permanent thing. The flashlight market, more so than the knife market, is driven by a spark of competition (as opposed to a desire to out Moku Ti the other guy). One innovation happens and it spreads like wildfire. Look how fast LEDs took over, or how quickly mainstream brands started running Nichia 219 emitters. True innovations take no more than two years to really get around. So if Prometheus/47 drops something interesting and the market reacts as quickly as it normally does, we could see a turnaround very, very fast. Until then, though, there is no clear winner in the EDC flashlight market. But if the production market is “the worst of times” (and it is really isn’t, the emitters themselves are incredible), then the custom market is the best of times. After the Haiku and the Tri-V hit, there was a long, quiet lull in the custom market. It looked like the market might even die off. But now we have so much innovation, design greatness, and....wait for it...availability, that I can’t think of a part of the EDC world that is healthier and more amazing than the market for high end lights. HDS is running on full steam, Barrel Flashlights are invading Instagram, Torch Lab is making bleeding edge stuff, and Muyshondt sits atop the flashlight world, the reigning king of cool bright things. But that is not all, there are handful of smaller brands that are doing very interesting stuff. Silent Thunder is making some supa-crazy stuff. Their Eye of Sekeht is unlike anything else out there, but it has an appealing design and some crazy materials. Who would think that you could have a drop down menu choice for contrast wood butterflies on your EDC? TM Design and Fabrication is making some sweet torches as is OKLuma. And these are just a few of the more esoteric brands out there. The flashlight market is aboslutely insane right now and performance has never been better. We are seeing great outputs, good runtimes, and excellent tints up and down the price spectrum. In terms of light output flashlights are an embarassment of riches right now. But production lights have a way to go in terms of design. What to do? The Surefire Titan Plus (review and buy), as I have modified it, is the best EDC light on the market, but I have a new clip from Prometheus and I took it to a machine shop and had them grind away the useless lanyard attachment point (useless because there is already a lanyard attachment point on the flashlight toupee that comes with the Titan Plus). Stock, it is very good, but not the best. 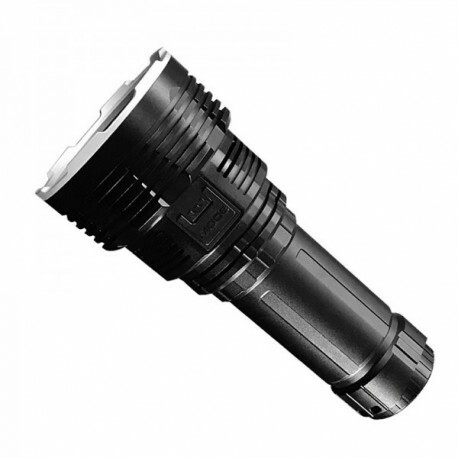 Then there is the oLight series of lights. The S1R (review and buy) is a great light with a terrible clip and mediocre throw. As an EDC it too is flawed. Zebralight (buy) makes great bodies but runs a pukey UI. Eagletac likewise has great bodies but ho hum outputs. Over and over again, I look through the production lights out there and think “This light would be great if...”. I am just not convinced that any of these lights really earn the title of best light. The Ultratac K18 is the closest I can get to a problem free recommendation—a good side switch, output that bests the Titan Plus, and a $30 or so price tag, but it lacks a clip worth a damn, too. In the end, I think this is the right call circa 2018. I’d love to recommend the still incredible MBI HF-R (review), but that seems like more of a frustration than a recommendation as they were released in terribly small numbers and are out of production. Still, for a light that sold under (just) $100, this is an amazing package. Its a bit brighter than the Titan Plus and costs 1/3 as much. It lacks the robust build quality of the Titan Plus, but it is not, by any means, flimsy. Overall, I am very impressed with this light. I especially like the fact that the lanyard loop helps the light tailstand. The sideswitch’s debounce times are bit awkward, but other than that and the horrendous pocket clip, I have no real criticisms. This is a great light. Now if I had more experience with this light, it would be the number one choice. I have owned two of these and the first arrived in “paperweight” mode, that is, it didn’t work at all. The second arrived and has functioned flawlessly. Its combination of great outputs, easy to use UI, and the best body tube on a light not costing over $400 is an enticing package. Its just that one hiccup that has stayed my hand. If the light continues to work and the market continues to produce flawed stuff, this will be my recommendation for Best All Around EDC next year. Of course all of the problems with production lights are solved if you have more money to spend. The Aeon Mk. 3 and its new iteration the Mk.3 v.2 are just awesome with marathon runtimes, a perfect form factor, and an output quality second only to the sun itself. Note to all production companies, this is how you do a good pocket clip. Please stop it with the friction fit clips. They are awful. What do you get when you combine the broad beam of an aspheric lens and a body tube design that is very similar to the great oLight S series? Probably the best worklight you can drop in a pocket. In a world separate from our normal EDC flashlight world, worklights range from goddawful to insane. At the bottom of the spectrum you have light bulbs housed in a plastic cage with long cords and a hook that cost $8 from your local Ace. At the top end you have the mega bonkers Festool Syslite Duo with Tripod (for a bargain price of $460–I am not kidding, that is a bargain for anything with the Festool logo on it). If you can’t justify the Syslite, but want quality broadbeam output the Klarus kills it. Having used it on multiple projects (and as the light in a lot of my newer videos), I can tell you that this is a great performer. The fact that it costs around $50 and fits in your pocket makes it a no-brainer. No collection of flashlights should be without a good worklight and if you don’t have the bucks for a Syslite, the Klarus deserves a spot. With a build quality that is reminsicent of an Ankylosaurus (even his eyelids had armor! ), the HDS torches already had a niche. But when Henry debuted the rotary UI, I knew things were different. Simply put this UI solves all of the UI problems at once. Want to come on in high or low without fiddling with programming? Done. Want one button press high or low activation (Jonathan)? Done. Want mode memory? Done. Want to be able to tell what the output will be without having to turn on the light? Done. Want a simple and intuitive way to control output? Done. Time and again, nothing comes close to the HDS Rotary’s simple and simply superior UI. Enrique’s emitters are always top shelf—the best money can buy. But the Beagle doesn’t just give you one emitter, it gives you six. And it is not in the typical jam-them-into-the head-of-the-light-to-make-this-thing-brigther set up. Nope, the array is designed to give you two different beam profiles—a floody lower light one and a tighter high output mode. This design has been seen before in the McGizmo Lunasol series, in the later versions of the Gat Light, and on a pair of Surefires—the original Aviator and the new one. But none have been as refined as this. Plus this is the only light to use a dual array emitter set up with Hi CRI output. Best of both beam pattern styles AND Hi CRI? Yes please. What? A Streamlight? Yep, a Streamight. Sure the outputs aren’t great as the two modes are bright and brighter, with no real low mode. And yes, it can’t tailstand, which almost kills it for this entry as a ceiling bounce is a great way to light up a room when the power is out. But the dual battery format is a huge plus, as is the straightfoward clicky, and the great beam pattern. The fact that the light is around $35 means you won’t be worried about loaning it out to friends and family during a power outage. You might be a bit more covetous of your Beagle or BOSS 35, but this is a light you can give out without incurring a bout of anxiety. Basically, if you need a light in a power outage and there is no reliable way to get batteries of your choice, this will take SOMETHING that is left at the store and be bright with good throw and still be easy to use. It may not be an aficianado’s choice (that would be the above HDS Rotary), but it is the right one. Jeff Hanko has been making amazing lights and hosts for years. The Trident, with its twisting grooves in a Zirc body represents an achievement in machining. I’d still vote for the SPY007 as the best machined light in the world, but this is a close second. The strange thing is how the light has taken off. If you have a high end flashlight collection and want to catch some eyes on Instagram, this light is a must. And to really put the crowning touches on things the light absolutely has to, 100% has to, have a Steelflame clip. Why bother with bling if you are only going halfway? For me, I’d like a lion skull/cyborg with a laser emitter ruby for one eye and a knife between the skull lion’s teeth. Oh and make it out of MokuTi. Its 2 AM on the quiet streets of Dubai. You are still awake because of the time zone change. The bilstering heat of the day has given way to a dry, cool evening, perfect for cruising. You decide to take a spin. On your journey, the Rock pulls up next to you at a stop light in his Pagani Huayra. He nods and feathers the gas. A throaty roar comes from the rear of his car. You nod and accept his challenge and issue your own bellow as you tap the gas on your Chiron. It is a hypercar drag race. The light drops to green and both you and the former WWE champion hammer the gas. Tires squeal and smoke bellows as the two hyperbeasts come alive with kinetic fury. Hurtling down the road you both pass 100 MPH in seconds and scream towards glory. Suddenly you hear a pop and the Rock’s tire bursts. Thanks to the Huayra’s amazing handling and stability, the car doesn’t crash and the Rock manages to pull to the side of the road. You double back to help the Brahma Bull (and rub in the fact that you won). When you finally make it back to him he is on the side of the road trying to repair his flat with the comically useless tire patch kit that comes standard in hypercars. He is having trouble in the dark. You reach over to the glove box of your Chiron and grab your torch. Which light is it? The Lux RC Artifact—the only uber torch capable of not seeming out of place in a Chiron. With its state of the art emitter, programming, and materials, nothing, not even the venerable and equally bonkers SPY Tri-V holds a candle to the Artifact. Hand painted ceramic body? Yep. Why? Because you can. After all you own a Chiron. What’s the difference between a laser and and a flashlight? I am sure some physics person can give you an actual explanation, but if you come here for physics insights you are definitely in the WRONG place (in fact if you come here for anything other than cheeky gear talk you are in the wrong place). Whatever the actual definition, once you see the Imalent DX80 catch stuff on fire like magic, you might think there is no difference. This is, as of this writing, the brightest, most gonzo light on the market capable of punching through the darkness like a Bond villian’s superweapon punches through the hull of an unsuspecting tank. And for that reason alone, yes, I want to review one. Is this the light that mortally wounded 47s? Regardless of its business impacts, this is one of the ugliest, poorest functioning, and worst designed lights ever to be sold to humans. It was a crenellated mess. The on switch’s main features were that it would turn on unexpectedly AND give you the worst case of Hot Pocket ever. And the pocket clip, apparently, was designed to cut the fabric of your pants. I liked the size and some of the modularity here, but man was this thing a crash and burn. But imagine it in blood red or emerald green and you see how it could definitely fit on the godawful Star Trek reboot. Their Klingon ship designs are among the worst ships in all of sci-fi (note: I have been spoiled by the realism of the Expanse, I am not sure if I can take any Trek ships seriously anymore). They all look like coffins that have been suped up by Rat Rod modifiers. So in that sense, the Paladin fits right in.